Andriy M. (the name was changed) is one of those Kiev white-collar leftists, who after some hesitations supported Maidan last winter and in spring took a decisive stand against the reaction in Crimea and in Eastern Ukraine. His stand finally led him to the Ukrainian army and now Andriy is taking part in the ATO (Anti-Terrorist Operation) in the Donbas. Having known this, “Nihilist”  asked him a few questions. Republished courtesy of Zbigniew Marcin Kowalewski. 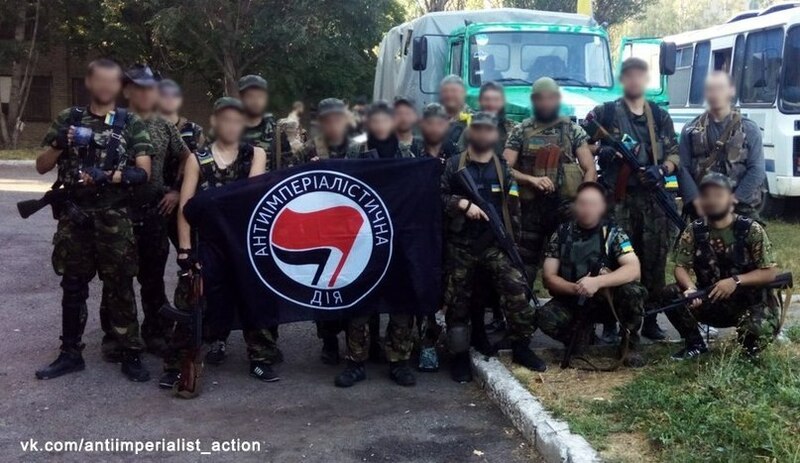 Ukrainian soldiers in Donbas with the symbol of Anti-Fascist Action – and slogan ‘Anti-Imperialist Action’. – How did you come to join the army? What unit is it? – A very ordinary one, the 72nd Separate Mechanized Brigade. The one that was surrounded near Izvarino in July. In that time it was constantly being shot at, while suffering heavy personnel and equipment losses. Four hundred soldiers were even forced to withdraw to Russian territory, an outcome that generated a lot of media hype. Later the Ukrainian troops gained control of Savur-Mohyla barrow, liberated the surrounded brigade, and led it out of the ATO zone. In August-September near Melitopol the brigade was replenished with personnel and armored fighting vehicles. I then joined that brigade as a gunner and was mobilized in August. At the moment the brigade is again in the ATO zone. – Could you have evaded military service? – Technically yes, definitely I could. But already in March I went to the military commissariat and told the commander that the army can count on me. At that time Crimea was just annexed and the riots in the Donbas and Kharkov had begun. It was clear to me that a big war was coming. I was also convinced that Russian Army intrusion was a matter of a few weeks. For me the Putin regime, Russian occupation, and ideas of “Russian World” are absolutely unacceptable. Therefore it was impossible for me to remain a bystander. Then everything went a bit different than expected. Instead of regular army invasion, Putin began by using local paramilitary formations, but in reality it did not change the situation. Of course, lots of friends offered me “help” – shelter, leaving Kiev and going abroad, applying for a visa etc. I did not take such alternatives into consideration for reasons of principle. – Do you characterize yourself as a leftist and a Marxist today? – In respect of beliefs, a worldview – definitely yes. However, if one takes a point of view that sees Marxism as a political practice in the first place, I could be reproached that according to this criteria I am not a Marxist. I will not argue with that, but I just ask whether the Bolsheviks were Marxists when they were defending the Kerensky government from the Kornilov Revolt. As a Marxist, I am aware of the fact that today a Ukrainian state is an unpleasant thing. There are very strong rightist conservative and nationalist tendencies there, with the power in the hands of big capital – the same as before, a powerful offensive is launched against the social component of state spending and workers’ rights. You know, as in the “socialist realist” art, the priority was depiction of a conflict between the good and the better, today in the Donbas there is a conflict between the bad and the worse. In Russia right-wing conservatism and authoritarianism are not just a tendency but full reality. The new expansionism in the sauce of the “Russian World” is a disgusting reactionary ideology that in reality is translated into war, violence, lies and hatred. In the Donbas all of them are in full bloom and trying to expand themselves. In my opinion, the main task is to stop it. Referring to the Kornilovism analogy, I will mention that a good friend of mine, a socialist, says that this war takes place between Petliuraites  and White Guards. This analogy is a bit lame, but in the situation when at war there is no communist side, for me as a Marxist the choice between White Guards and Petliuraites is obvious: in favor of the latter. At the same time it is evident that we are not even allies but just fellow travellers and just to the first crossroad. – What do you think about Maidan? What was that? – Maidan is a very complicated theme. On the one hand, it was a popular uprising and an experience of the self-organization of the masses, followed by the creation of volunteer battalions and a powerful and effective network of volunteers supporting those battalions, but on the other hand, there was an openly right-wing political wrapping. My approach to Maidan was changing from careful neutrality towards critical support following the infamous 16 January Laws. In any case, even the very right-wing wrapping was not sufficient to discredit the powerful democratic component of Maidan. In my opinion, it is enough to deserve acknowledgment. In any way, Maidan is in the past now; we live in the post-Maidan epoch and at the moment that mixture of progress and reaction, prepared on Maidan, is breaking down into its components: so much the better. It would be easier to separate the wheat from the chaff. 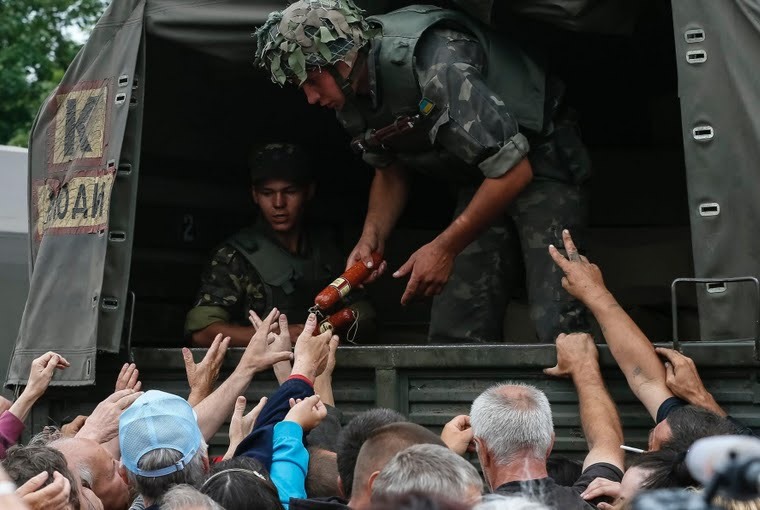 Soldiers distribute aid in Slovyansk following the re-capture of the City. – What is this war for you? – Firstly, it is a huge tragedy for millions of people – sorry for the banality. The civilian population is being disinformed, deceived and terrorized by both sides. In those rare cases, when the dialogue with the local inhabitants is held, the majority of them ask: “Why have you come armed to our land?” When you answer: “To prevent separatists and Putin’s soldiers from coming armed to our land”, they do not accept it. However, this is a real goal. There are lots of aspects of this war and I clearly see political profits gained by the Ukrainian and Russian elites – the profits generated from sufferings of local population and Ukrainian and Russian soldiers. For me personally, such phantasms as a territorial integrity or a national statehood have no meaning and I do not see them worth life and blood. However, if Ukraine lays down arms, the war will not stop but imperialist Russia will just continue its bloody expansion undisturbed. It is an aggression and the aggressor must be stopped not appeased. Unfortunately, there is no good solution here. One has to choose between the bad and the worse. – What are Ukrainian soldiers in the East fighting for? – Every soldier is fighting for his own reasons. For example, my colleague, a Maidanist and romantic nationalist, Sanya is fighting for his fatherland and the centuries-old Ukrainian dream of independence. A robust peasant, Misha, is fighting so that no-one from abroad tells him, his children, and grand-children what rules they should live by. An electrician Serhiy is fighting only because he was mobilized and he is very unhappy with it. He is also personally unhappy with the commissar who sent him to the slaughter instead of somebody more suitable. However all that does not prevent him from performing combat missions with dignity. Some people do not hide that they are fighting for money – due to the poverty and unemployment in civilian life, going to war has become a noteworthy alternative for a number of people. The majority of soldiers are convinced that they are fighting for Ukraine, its territorial integrity, the right to live not on orders from Kremlin, preventing “Donetsk bandits” and “commies” for good from trying to govern the country. That is the main motivation. – It turns out that the soldiers are anticommunists and it is a mass phenomenon. How could you explain it? – There is a great temptation to shift the entire responsibility to the Communist Party of Ukraine (KPU). The party of Petro Simonenko did really all that could have been done to make the word “communist” offensive. Years of serving the interests of oligarchs accompanied by the socialist rhetoric and last year’s explicit support for the enemy – all that leaves a trace. However, this is not only the matter of the KPU. The ancestors of numerous soldiers and officers were victims of Stalinist repressions or died during the Holodomor (extermination by famine). For each of them those things are not an abstraction or historical events but a tragedy that directly touched their families, a crime committed by the Soviet government. And through two decades the Ukrainian state propaganda machine was successfully flooding the masses with the idea that the famine, violence and executions are the essence of communism. No wonder people easily adopt it as their own viewpoint. – Does a communist feel comfortable in such an environment? – Of course not. But there is one good principle: “neither to cry nor to laugh but to understand”. To keep one’s cool. To notice that the hatred to communism among the masses of soldiers is not hatred toward the ideas of justice, cooperation, solidarity and freedom. On the contrary, it is hatred of the social parasitism that typifies communist party hierarchies, and hatred of the total physical, ideological and economical violence. And it is entirely compatible with sharp non-acceptance of the new post-Maidan government. For the majority of soldiers Poroshenko, Yatseniuk and Klychko are no better than Yanukovych. The timeliness of the social question has not been abolished. Certainly, today the ultra-right forces are trying to speculate with it but that is because the left in Ukraine turned out unable to play on its traditional political field. – Is that why the left has lost in Ukraine? – It is a complicated question. Now I am to say a handful of standard phrases about the combination of objective and subjective factors. And where did you see a victory of the left in the period of primitive accumulation and redistribution of capital? The actual left-wing class-oriented mass movement has not been able to form yet – one cannot take for the left the Soviet-conservative KPU or pale pink bourgeois socialists! Not to mention commercial and technological political projects like Borotba, which, from the very beginning, were created to fulfill completely non-leftist tasks. Those left-wing organizations that were actually trying to fulfill the proper tasks, either were organizationally too weak to grow out of little circles or turned out to be so accustomed to the certain conditions that they were not able to realize themselves outside those conditions – like for example the Direct Action . – Has your approach to the Western and Russian left changed? – What should be done? – To observe attentively. In no case to shut away in an ivory tower but, quite the contrary, to be in the thick of things, as close to people as possible. As a matter of fact, it is another reason why I am in the war now. As long as we have the first-hand experience of what the people of Ukraine live and breathe, we will be able to create an effective strategy and tactics. A very complicated time is coming. A right-wing consensus in the society combined with an unsolved social question can lead to a fascist coup. One should become aware of this danger and prepare for it. To educate the masses, to propose a solution to social conflicts that would be based on a class approach. That solution must be more effective than the one proposed by the right-wing national-social populism. And I have fallen into the abstract again. Let us finish the war and then we will talk about this issue in more detail, ok? “Nihilist” is a web portal edited in Ukraine by anarchists and left-wing anti-authoritarian radicals who try to “combine constant theoretical search with everyday revolutionary practice”. Petliuraites was the popular name of supporters of the Ukrainian People’s Republic, formed in Kiev after the fall of the Russian Empire. It existed since January until April 1918 and since December 1918 until November 1920. It was in war both with Soviet Russia and the imperialist Great Russian White Guards. Its Commander-in-Chief and, since February 1919, its President was Symon Petliura. The Direct Action (PD) is a network of independent students’ unions, with a left-wing anti-authoritarian and syndicalist orientation, established in 2008 in Kiev and active also in some other universitary centers of the country. Previous Torture as usual at Kyiv police station?